The Relyence Fault Tree-FMEA link offers unique analysis power. Relyence Fault Tree provides a powerful platform for assessing risk using fault tree techniques. Relyence FMEA also is a platform for risk analysis based on failure mode and effects analysis. Using the two together provides comprehensive risk assessment abilities. The unique to Relyence Fault Tree – Relyence FMEA link takes risk analysis to a new level. Relyence FMEA enables you to autogenerate a Fault Tree using your FMEA data. A common method for completing risk analysis begins with FMEA (Failure Mode and Effects Analysis). FMEAs enable you to effectively organize, categorize, and prioritize your system risks by reviewing all the possible failure modes and evaluating the potential effects of those failures. In some cases, you may want to delve deeper into the assessment of critical or high impact risk items by performing a fault tree analysis to more quantitatively measure the risk. 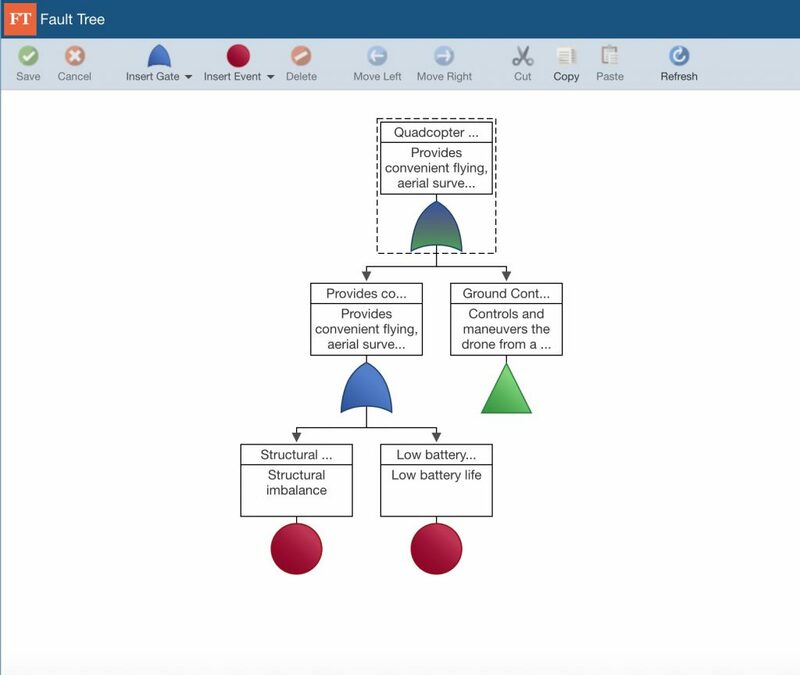 Relyence makes this transfer an easy one-step process: engage the Create a Fault Tree from FMEA function and Relyence steps in to create your fault tree built from your FMEA. You may then choose to keep your fault tree and FMEA analyses in sync, or simply break the linkage and build out your fault tree in more detail. One of the significant advantages of using the Relyence platform is that all your analysis modules share a common behind-the-scenes database, so data integration and sharing is streamlined and efficient. When using Relyence Fault Tree along with Relyence FMEA, this advantage is uniquely enhanced with automatic syncing. By keeping your fault tree analyses in sync with their related FMEAs, you can rest assured your risk assessments are well maintained and nothing is overlooked. Relyence Fault Tree and Relyence FMEA support automatic linking so your risk analyses are always in sync. 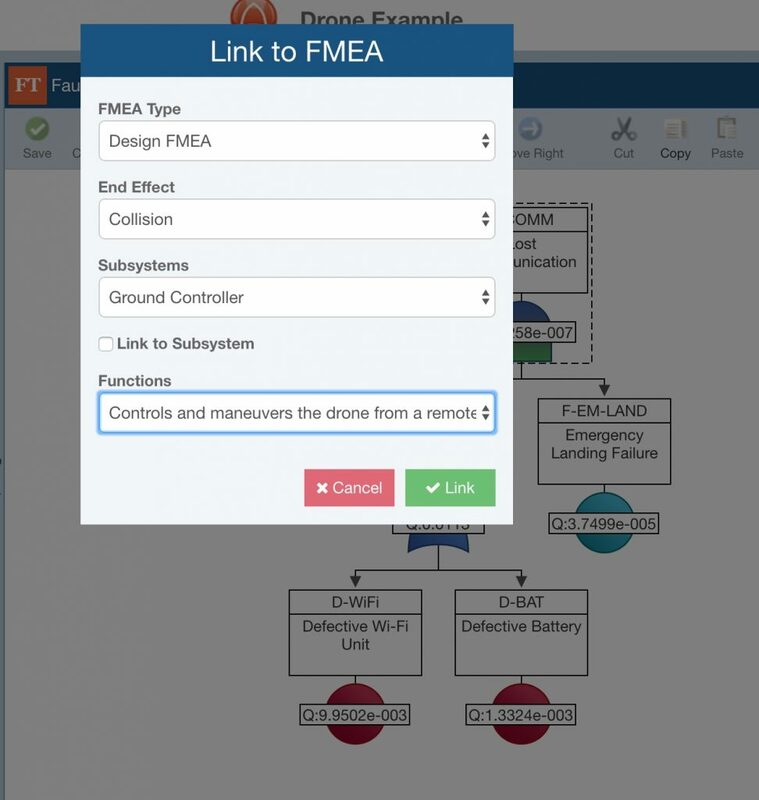 You can link items in your fault trees to FMEA items if you want to keep individual risk elements linked. The Relyence Fault Tree-FMEA link does not require you to perform the initial autogeneration, or know all your linkages in advance. You may just prefer to link up important or critical items to keep those you deem most significant in sync. Relyence Fault Tree supports this by allowing you to link to your FMEA items from your fault trees. The Relyence Fault Tree-FMEA link is not only a powerful feature, but designed to be flexible to allow you to work the way you choose.